MULE: Last year Badly Drawn Boy opened the festival from the precinct balcony overpass; are there any plans for similarly inventive spectacles? Philip Hannaway: Well we launched this year with secret performances from Alan Cochrane and John Bishop, which was pretty special. Coming up this Sunday [27 May] we have an outdoor performance on [Chorlton] Green complete with grand piano. 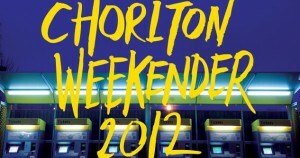 There also are a few surprises over the Chorlton Weekender so keep a look out on the streets! You should also look out for the work of our Digital Arts Collective; there will be happenings all over Chorlton as the festival comes to a close. MULE: One of the more complex multi-arts shows was the gig featuring Swimming, Dallas Simpson, headphones, video links and a detached audience at St Ninian’s Church – can you explain how this worked? PH: This was a really amazing night. The band actually performed in the Church Hall away from the audience who were in the main church. We watched video of them performing live in the other room. Dallas Simpson [a sound artist] moved around the room and we pick up through our earphones what he is listening to. He used all kinds of tubes and equipment to pick up various sounds of the band. 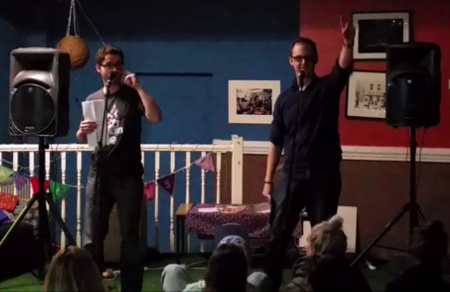 It was a totally unique event and a first headphone-only gig in Chorlton. If you had walked into the church there would have been complete silence. It sounded amazing. MULE: The festival is also about highlighting the local arts and music in the area and many of these shows will be free entry. For those spoiled for choice, could you personally pick out and recommend any of those to attend? 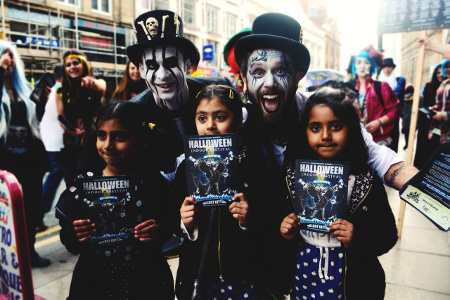 PH: There have been so many great events in the community this year and in the last few days of the festival there is even more to look forward to. I’d make sure you check out our street art exhibition by local artist Trafford Parsons – you’ll find his work on shop shutters around Chorlton. Perfect for a stroll in the evening. There’s also our visual arts exhibitions in Electrik, Marble Beer House, Battery Park and Oddest and a really bold art installation at Creative Corner Café from award winning Elysion Productions. There’s also loads of free music going on around Chorlton over the weekend including some parlour sessions at Dulcimer. All the information can be found on the festival website. Of course you would not want to miss the Weekender headliners as well, including Dutch Uncles, The Handsome Family, Chew Lips and Lanterns On The Lake. MULE: How can the festival benefit local artists and musicians? PH: I think by firstly providing a platform for local artists to show their work. But also the festival provides an opportunity for their work to be seen alongside artists from around the country and the world. We try to be an outward looking festival, which never forgets that it has the community at heart. We hope that local artists will be inspired by what other people are presenting at the festival as they develop their own practice. As for music the festival gives an opportunity for local bands to perform alongside some of the best talent from around the UK and beyond, giving them an opportunity to be part of a great line-up right on their doorstep. MULE: Venues such as Dulcimer are locally renowned for staging regular and dependable live music; what can we look forward to there during the festival? PH: There’s loads going on in all our venues. Over the Weekender at Dulcimer you’ll see local bands Blind Atlas and I Am Mechanical perform, there will also be an all day event on the last Sunday of the festival [27 May] with loads of local musicians performing. Also in Electrik on the last night of the Weekender you can enjoy a One Deck Session from club night Pop Till You Drop. MULE: How closely do you work with venues when deciding the festival schedule? PH: Very closely, the festival would not be possible without the support of the venues. MULE: Are there any less frequently used venues to look out for? PH: There are loads of events at Creative Corner Café this year for the first time; it’s a great space, with great people running it for the right reasons. Everyone should check it out. MULE: How important is it for the festival to accommodate initiatives such as the FlashTag flash fiction writing competition into the programme? PH: Really important; any event that allows people to take part creatively is really important to the festival. It’s a fantastic way for people to get into writing and as a festival we are all about people getting stuck in and trying new experiences. FlashTag flash fiction delivers on all of these. Chorlton Arts Festival continues until Sunday 27 May across various venues in and around Chorlton. Specific events can be found on the festival website. An edit of this interview first appeared on the Now Then Manchester blog.